Habit: Plant loosely cespitose, 30--70 cm; rhizome ascending; stolons short (0). Leaf: flat, acute; basal leaves 4--8 mm wide; cauline (3)4--5, to 7--10 cm, 3--8 mm wide, lanceolate, acuminate. Inflorescence: loose, occasionally nodding, main branches occasionally to 13 cm, flowers 1; lower bract 1.5--4 cm, < inflorescence. Flower: perianth parts 1.8--2.3 (2.4) mm, acute. Fruit: >= perianth, oblong-elliptic, acute to acuminate, awn 0.1--0.2 mm; valves 1.9--2.4 mm, 1--1.3 mm wide. Seed: 1.1--1.3 mm, 0.6--0.7 mm wide; appendage 0--0.1 mm. Chromosomes: 2n=24. Note: Intermediates known between subspecies. Leaf: basal leaves to 7--9 cm, 5--8 mm wide. Inflorescence: many-flowered; main branches long, distal 2° branches short. Flower: perianth parts 1.9--2.3(2.4) mm, medium-brown; anthers 0.4--0.5 mm, filaments +- 0.5 mm. Fruit: valves 1.9--2.3 mm, 1--1.3 mm wide, dark brown. Citation for this treatment: Jan Kirschner 2012, Luzula parviflora subsp. parviflora, in Jepson Flora Project (eds.) Jepson eFlora, http://ucjeps.berkeley.edu/eflora/eflora_display.php?tid=51477, accessed on April 19, 2019. 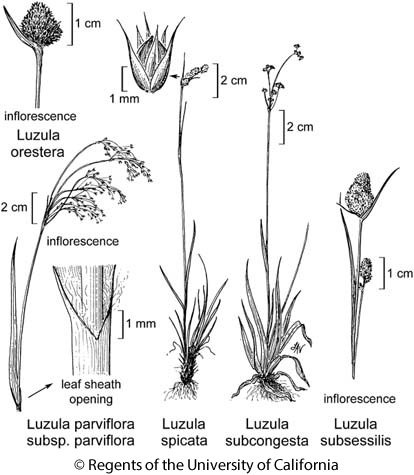 No expert verified images found for Luzula parviflora subsp. parviflora. NW (exc NCoRI), CaRH, SN, Wrn; Markers link to CCH specimen records. Yellow markers indicate records that may provide evidence for eFlora range revision or may have georeferencing or identification issues. Purple markers indicate specimens collected from a garden, greenhouse, or other non-wild location.